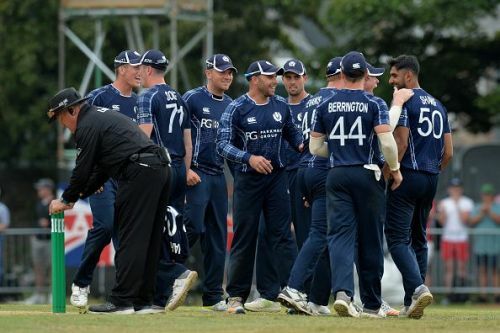 Its time for some international T20 feast in the shores of Oman as the opening fixture of the Oman Quadrangular Series 2019 will see Scotland take on the Netherlands at the Al Amerat Cricket Ground in Al Amarat on Wednesday, February 13. Head to Head : Scotland and the Netherlands have faced each other on nine occasions in the T20I, with the Scots marginally leading the scoreline at 5-4. While in their most recent face-off during Netherlands Tri-Nation series, the Scots thrashed the Dutch by a hefty 115-run margin. After electing to bat first, Scotland rode on Munsey's 34-ball 71 to post a giant total of 221/3 in their 20 overs and in reply the Netherlands never looked in the chase and were eventually bundled for 106 in 14 overs. Scotland will bank on their recent T20I record against their opponents. They have beaten them comprehensively on previous four occasions and will begin this clash as overwhelming favourites. Skipper Kyle Coetzer is the team's leading run-scorer in T20Is with 1035 runs, while his opening partner George Munsey was their key run getter in the Netherlands Tri-Series with 204 runs, and these two will be eager to replicate their previous show against the mighty Holland side. In the middle order Richie Berrington and Matthew Cross are no less than a rock and are capable of scoring at a brisk rate. These two have been among runs in recent past and will be expected to play a noteworthy knock here. When it comes to bowling, Safyaan Sharif and Alasdair Evans are going to be their key strikers. Both have taken most wickets for the side in the shortest format and will be crucial for Scotland's chances in the Quadrangular series. While Hamza Tahir and Mark Watt are the other bowlers in the side who can trouble the opponents with their variations. Kyle Coetzer (C), George Munsey, Matthew Cross (W), Richie Berrington, Calum MacLeod, Ruaidhri Smith, Michael Leask, Safyaan Sharif, Mark Watt, Alasdair Evans and Hamza Tahir. The Netherlands will begin this clash with an aim to end their poor T20I run against the Scots and attain necessary momentum before facing Ireland and Oman in upcoming fixtures. Ryan ten Doeschate is Holland's most experienced batsman and averages more than 42 in the shortest format, while Wesley Barresi has 764 T20I runs to his name, and these two will be expected to cruise the team towards a big total. Scott Edwards and Tobias Visee are also capable of playing big shots and will be eager to prove their worth on the international stage. Skipper Pieter Seelaar and Paul van Meekeren are the backbone of the team's bowling setup and it will mostly depend on these two to come out with their best and clinch a few scalps at the beginning. Except these two, the team will also need Shane Snater to level up his game and stop the flow of runs during the middle overs. Pieter Seelaar (C), Shane Snater, Paul van Meekeren, Fred Klaassen, Scott Edwards (W), Tobias Visee, Max O'Dowd, Stephan Myburgh, Wesley Barresi, Ryan ten Doeschate and Roelof van der Merwe.